Blessing Okagabare won the 100m of the Shanghai leg of the IAAF's Diamond League on Sunday. The Nigerian superstar powered home in 10.98 seconds, edging America's Tori Bowie who came in second with a time of 11.07 seconds, a personal best. Michelle-Lee Ahye from Trinidad and Tobago would finish in third. 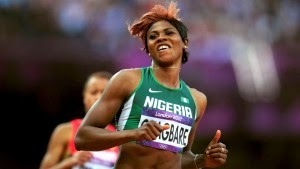 "My race was pretty good," Okagbare said after the event. "It is not easy to compete with the best of the world - but I won. I focused on my start. Normally I don't have the best start, but now I was leading from the beginning."